Living in the southern hemisphere, it is mildly difficulty to not get into and enjoy water sports to at least some degree. We are talking surfing, diving, snorkeling, swimming in the ocean and not the sexual kink variant – get your mind out of the gutter, filthy deviant! With the territory comes the need for appropriate gear – ideally, gear that does not look like being a merely utilitarian device but not so much on the fashion end that it breaks halfway through your adventures. Specifically in the realm of diving and scuba diving, it is vital to keep an eye on time and a watch can be the ideal backup to keep things on an even keel. Sure, there are simple watches that are cheap and might do the job but you might not want to be seen with an eyesore outside the wet realm. You also might be turned off by the idea of being identified as an action movie hero wannabe by the size of what you are lugging around and showboating on your wrist. Having tried different models, I found that the notion of watches suitable for diving and their short half-life do not seem to hold true. Most of what I have tried lasted surprisingly long and survived some pretty harsh, unplanned maneuvers. Canada, of all places, offers the Seaforth model via its brand Halios, which is affordable and easy on the eye as is Italy’s Modello Uno out of the house of Unimatic, which is a watch proffered as an Aqua Compressor combining traditional design with a modern twist. However, my go to aquatic timepieces have come for a while now courtesy of Freestyle USA. Yes, I am with you – some of their designs are a bit much on the “youthful” end of the scale, i.e. an LSD trip come alive, but they have models that look both classy, enduring and reliable. What makes Freestyle USA’s more affordable models tick is the fact that they are really comfortable to wear with their silicone straps, yet do not lack resistance – I have been pounded numerous times by waves I had underestimated and the watch survived without as much as a scratch. Their tide functionality for 150 beaches around this earthround and the fact that the buttons can be easily pushed underwater come as an added bonus. 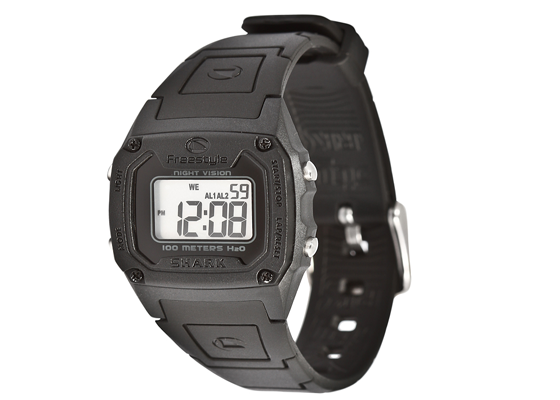 The appearance of their Shark Tide collection is very much on the stylish, cool end of the spectrum, which makes them watches that you can wear in more formal environments as well. It has the ability to display different time zones, accommodating your travel destination, and I have yet to encounter any problems that are related to condensation. Again, it tells you all relevant info about tide movements and when your surf session will get the most out of the local break as well as chronometer, sunset/-rise, night illumination function and I have yet to encounter a scenario where I could not see the display clearly, no matter if the sun was glaring or in darker scenarios. Compared to its size, the weight is minimal and it fits easily underneath shirts, i.e. does not look freakish on dry ground and it waterproof up to one hundred meters. 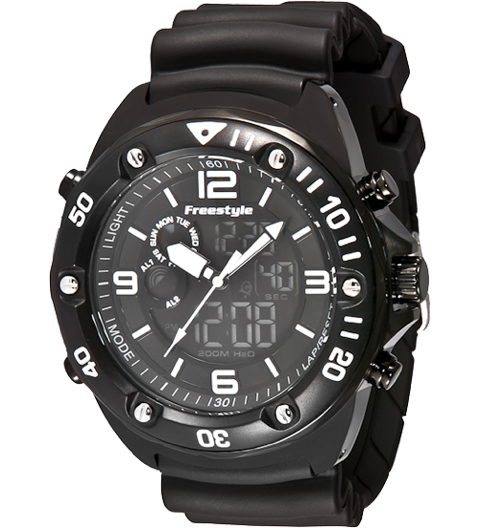 Freetyle USA’s Precision 2.0 is on the fresher yet subtle side of things with its mélange of analogue and digital modes and a solid 200 meter water resistance. Freestyle USA’s watches all come with lifetime warranty, which makes perfect sense given the elements they will be exposed to.